The evaluation is done to determine if a hearing loss is present, and if so, to detail the type and severity of the hearing loss. It also may provide insight into the cause of the hearing loss as well as provide guidance for our doctors of audiology in making appropriate treatment recommendations. The specific tests done during the evaluation will depend on the client's age, and what is known already about their hearing status. These various tests will indicate the degree of hearing loss, the type of hearing loss, and the conditions of the ear canal and middle ear. Our doctors of audiology will also determine if the hearing loss is conductive (middle or outer ear problem) or sensorineural (inner ear problem or central processing difficulty of the brain). A diagnostic audiologic evaluations includes pure-tone air and bone-conduction testing, speech testing, tympanometry and acoustic reflexes. Pure-tone air conduction testing determines the quietest tones that a person can hear at different frequencies, both low and high. Bone conduction testing is similar to pure-tone air conduction testing. A different type of headphone is used during bone conduction testing, and the results help our doctors of audiology determine if the hearing loss is originating from the outer/middle ear or from the inner ear. A speech reception threshold (SRT) test is often used with older children and adults to confirm the results of a pure-tone test. This test determines the lowest level at which the client can recognize words or speech stimuli. 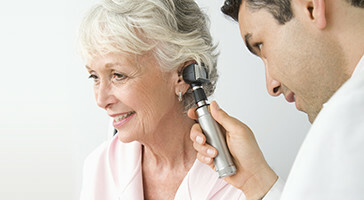 Our audiologists may also perform otoscopy (examining the ear canal), tympanometry and a test of your acoustic reflexes. This will determine the health of the ear canal and the middle ear, how well your eardrum is moving, and will measure the reflexive responses of the middle ear muscles. Specialized tests exist for infants and young children, as well as children and adults with developmental and cognitive impairments. These more-specialized tests allow our doctors of audiology to test the auditory system when the client is not able to actively participate in the tests or evaluation. To schedule an appointment with our doctors of audiology for a comprehensive diagnostic evaluation, call us today at (406) 586-0914.